Here are my latest offerings from my quest to paint all the Perps from the 1985-87 citadel Judge Dredd miniatures range. A favourite of mine 'Fuzz Gun' perp I think featured in a Daily Star strip where Dredd shoots the can attached to the gun covering the perp in hair but memory is hazy on this one so If you recall the story please let me know. I used to hang around with a punk rocker who used a similar thing and always left a black patch of hair on peoples sofa's :D Variants include Slaugther Margins 'Bel'. Next up we have one the rarer and lesser seen of the Mega City Defence miniatures of the range 'Citi-Def with Spug Gun'. This miniatures completes my set of all the Citi-Def from the range, I painted him in the same scheme as the others so the tie in nicely while defending Rowdy Yates block. Next is 'One Eye Schumaen' on the tab he is labelled 'Organ Legger', I went for a hispanic Banana City (Ciudad Barranquilla) look for this character, he carries a bag with human body parts spilling out and a bizarre pistol. 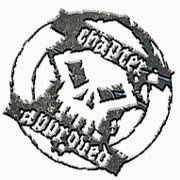 Variants include Slaugther Margins 'Vid Crew Sound'. Finally we have a JD5 Klegg, featured in the Judge Dredd story 'The Day the Law Died' (Progs 89 to 108). These carnivorous Alien mercenaries hired by Chief Judge Cal and paid in lawbreaker flesh. 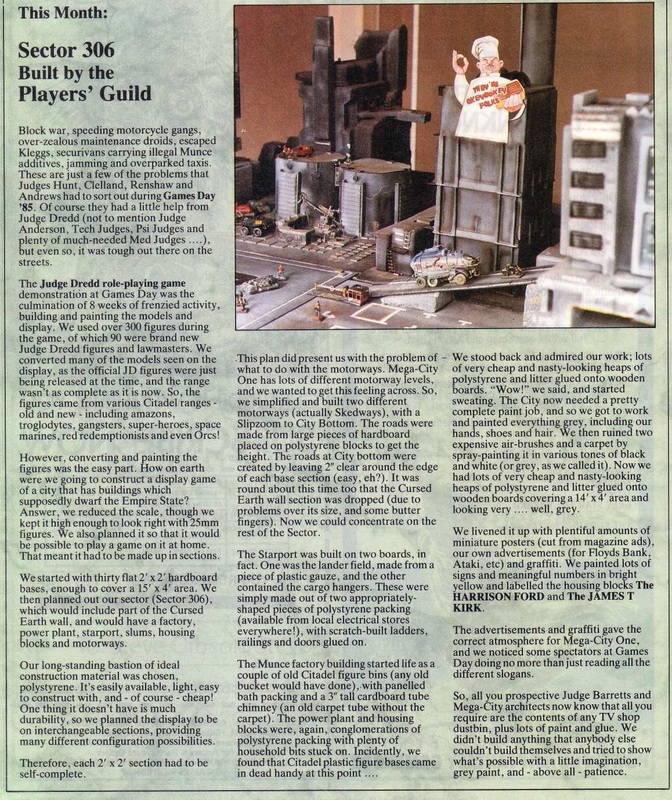 Only two miniatures were made, I first come across them in my favourite ever White Dwarf 78 and the fabulous display game done by the 'Player's Guild' for Games Day 85, I was obsessed with this display and my late friend and I did everything we could to copy it whilst taking over his parents veranda. 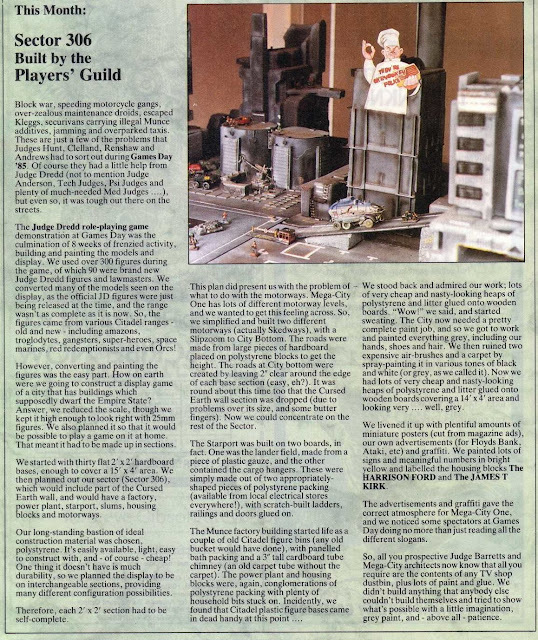 I raved on above about the Judge Dredd display in White Dwarf 78 so in case you have never seen it here it below for your enjoyment. 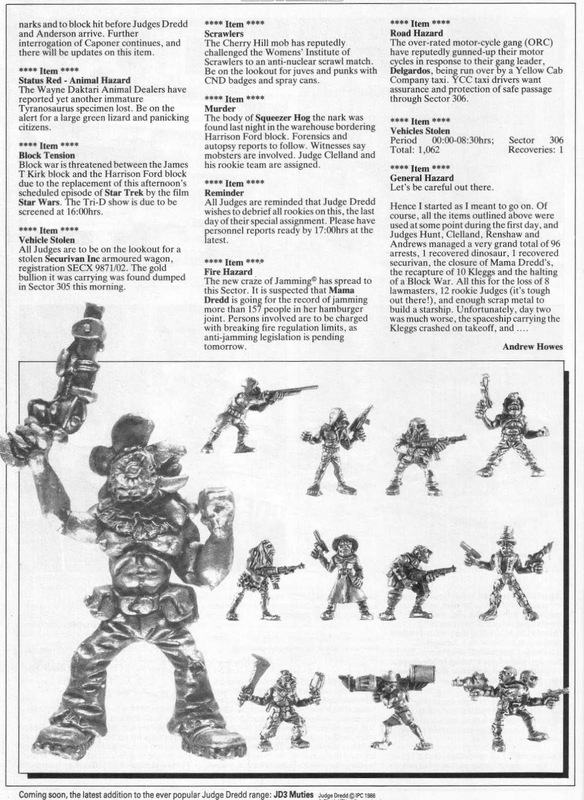 I remember mutating so many Airifx soldiers with milliput to supplement our small selection of Judge Dredd miniatures at the time. What a great piece of gaming history, thanks for sharing! Cracking work on the iconic Klegg colours. And nice touch adding the freehand to the Fuzz Gun. I've got a half dozen blisters of Kleggs bought from the Sheffield Space Centre. 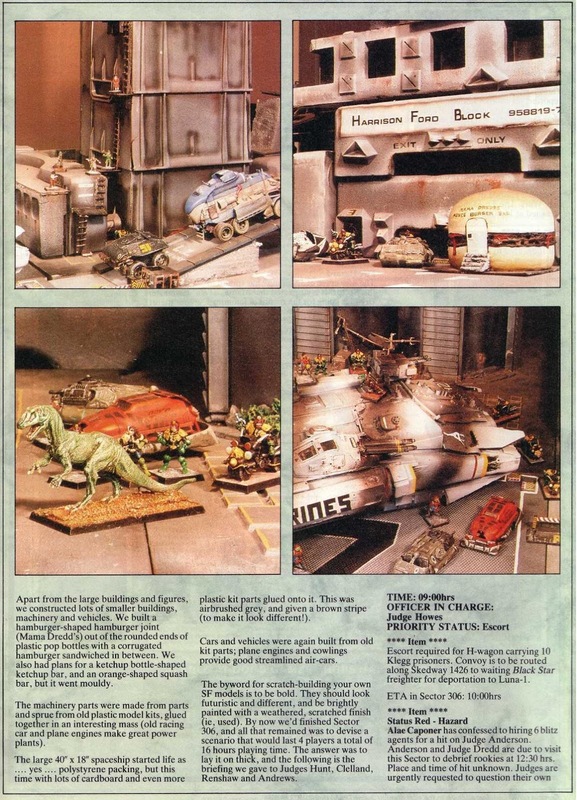 They're waiting to get painted as a Necromunda Gang or Imperial Guard exotic auxilia or legit 2000AD mercs for some BOYL 2000AD game. Be fun to convert and repose them to disguide the fact there's only two poses. 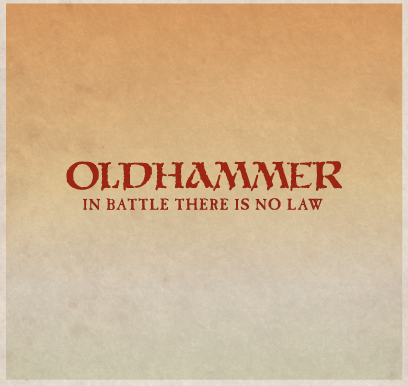 "Meaty beaty, Chop 'em neatly, death or glory, no retreaty!" Stunning work, Jason! 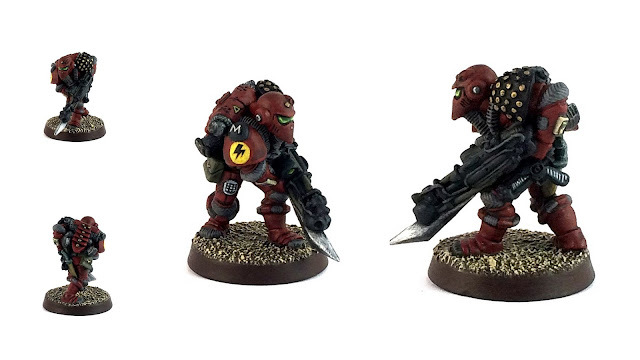 I've always thought that the Kleggs and perps would fit right into any 40K game. I hope you get a lot of use out of them, whatever you play.